Throughout the last 14 months, Tennessee has continued to experience historically low unemployment. Since May 2017 the statewide unemployment rate has been at or below 3.8 percent. April 2017 was the last time Tennessee’s rate was at 4.0 percent. Tennessee also experienced substantial job growth between May and June of this year. Employers added an estimated 13,000 nonfarm jobs during the time period. The professional/business services, information, and leisure/hospitality industries experienced the biggest job gains in June. Nationally, the seasonally adjusted unemployment rate for June 2018 experienced a slight increase to 4.0 percent, up 0.2 of a percentage point from May’s revised unemployment rate of 3.8 percent. Even with the small uptick, June’s national rate is 0.3 of a percentage point lower than it was the previous year. 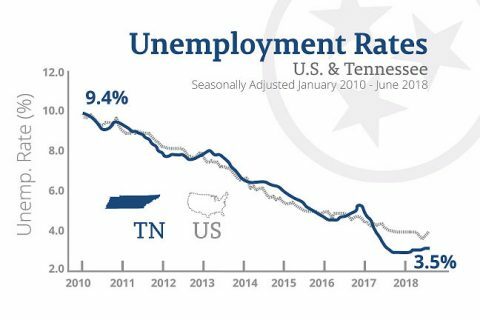 A complete analysis of Tennessee’s unemployment data for June 2018 can be found here.